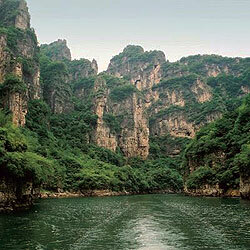 Yanqing County is an agricultural area, and is Beijing’s summer getaway, with numerous ancient tombs and caves. It has developed into a tourist area because the most popular part of the Great Wall, Badaling, is also in the county. Planting and harvest festivals are celebrated in the spring, summer and autumn, and ice and snow festivals are held in the winter. Yanqing also has ski resorts, and a number of hotels. Travel to and from Yanqing County is easy, because of good highway and railway connections.